Founded in 1979, Jep Pads are a UK based manufacturer with a wealth of industry experience. We understand the challenges of maintaining attractive functional displays, and can offer advice and solutions to deliver exactly what our customers need. All of our products are designed and manufactured in our Manchester based workshop using quality components. We produce a wide variety of display styles, ranging from classic and traditional, to modern and cutting edge, using an extensive range of colours and materials. We offer a choice of popular products in our catalogue in addition to a bespoke service where we can tailor your displays to meet your exact requirements. 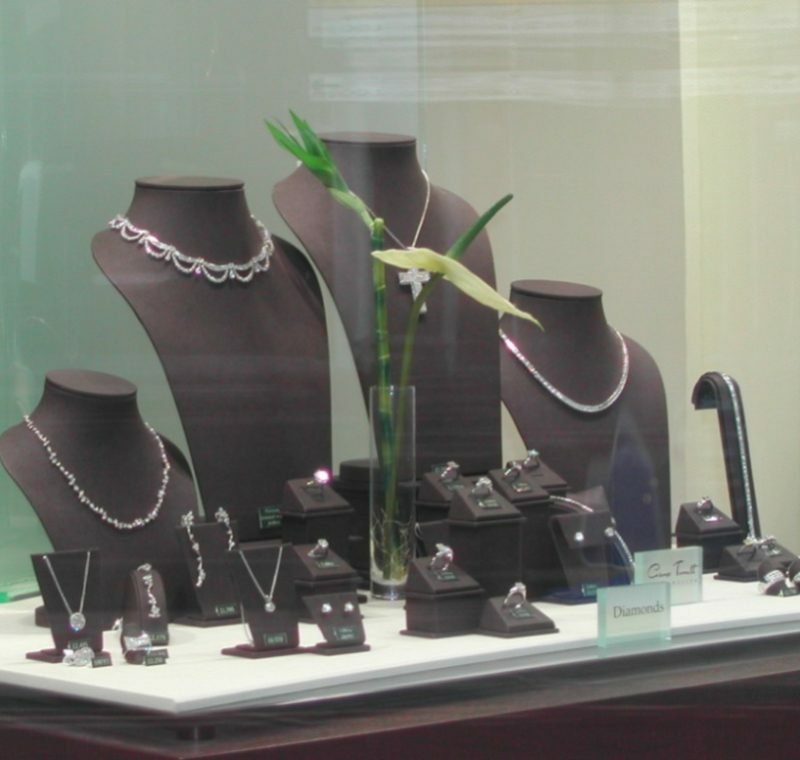 Our customers range from small independent branches to large jewellery retailers, we can supply cost-effective solutions from one off orders to full displays. We pride ourselves on our customer service which is second to none. Why buy from Jep Pads? The basis of all of our products is good quality woodwork and metalwork, this means that they are built to last, can be re-covered in the future for a fraction of the cost and should provide many years of value. Some competitor products available elsewhere in the market are often made with cardboard or flimsy plastic components, and therefore are considered ‘throwaway’ items when worn, resulting in the need to buy new again. All of our products are available in a wide variety of colours and materials. You can also mix and match different materials to achieve different effects. What we’ve shown on our website is just a small selection of examples, don’t be limited by what you see! We can provide you with advice and swatches so that you receive a display that works for you. We believe that good quality pads shouldn’t be thrown away, we therefore offer a re-covering service to keep costs down for our customers. We can re-cover all of the standard pads that are available in our catalogue, and we are more than happy to evaluate pads that have been bought from other suppliers. We make blocks and risers, any shape, any size. All windows and showcases are different, so you need components that will make best use of the space you have available. We can provide you with ideas for a layout, or work from your own specification. We offer an onsite re-covering service for your base boards, side boards, shelves, pelmets etc. Why struggle, leave it to the experts! We can also make new boards, or make adjustments to existing layouts. If you’re not sure how to make best use of the space you have available then we can provide advice and suggestions to help you to decide. A member of our friendly team can guide you through your requirements and come up with some ideas. Tracy Burns – As the next generation of the Jepson family, and also Director of the company, Tracy has worked hard to achieve excellence and a high level of customer service! Martin Cronshaw – As a senior member of our workshop Martin is responsible for the day to day manufacturing and dealing with bespoke requests. We are proud of our on-site manufacturing and ability to deliver most unusual requests, and Martin would be happy to talk through any technical specification or questions you may have. Sue Gittons – An experienced member of our creative team responsible for covering and finishing our products to a high standard. James Frizzell – James strives for perfection and enjoys being involved in delivering solutions to the highest standards.